In keeping with the recent theme, here’s another shot from the end of the semester trip down to NC. 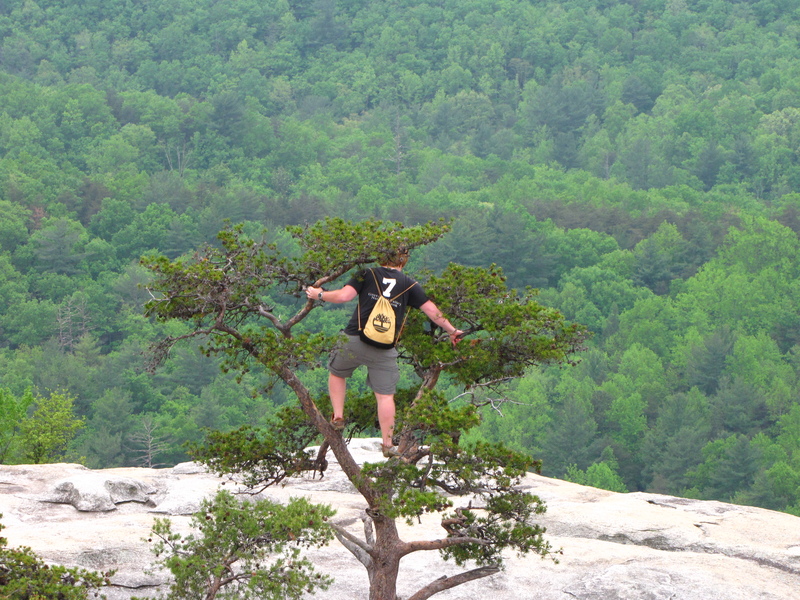 This one was taken at the summit of Stone Mountain, looking down on the forest below. It is quite a long way up from the bottom, but the view is definitely worth it, even on a cloudy day like this one was. I like the way this shot turned out. A pretty good balance between the foreground elements and the background ones. Looking down on the tops of the trees below, it’s pretty easy to see the dramatic change in elevation between the two parts of the image. I also really like the way he is standing in the tree, though I wish I had caught him with his head above that top branch. The one thing that I think would have made this shot better would have been for me to get lower, so that instead of looking down on the forest below, the image was looking out towards the mountains and skyline beyond. Just a neat little fire picture from the end of the semester trip to the cabin. I had to play around with the settings for a while before I got one that I was satisfied with. This shot has an 8/10 second exposure, which meant I had to use my mini tripod for stability. Longer exposures resulted in a mass of bright light, which made it a lot harder to see any details about the tips of the flame. 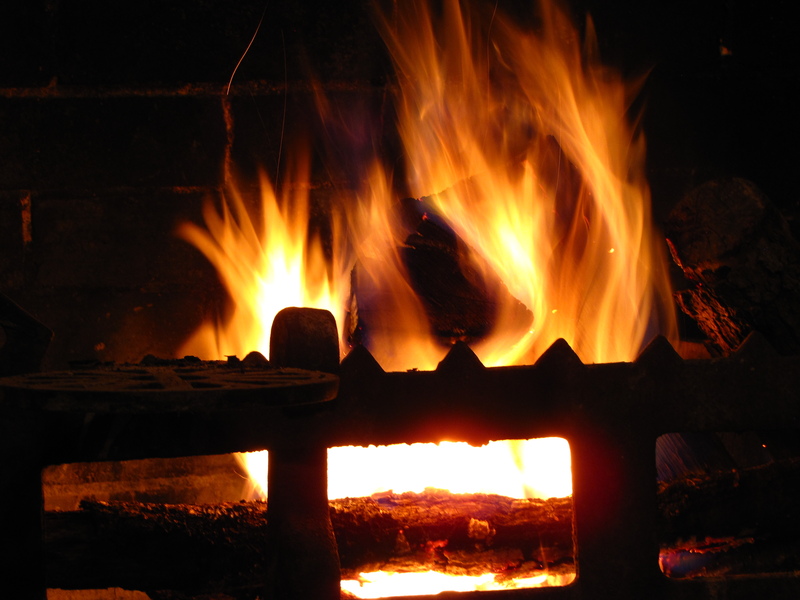 It also got rid of a lot of the different shades of orange that you can see within the flames, instead having just a mass of white light, with a small orange fringe around the outer edge. I also tried a shorter exposure, which was better than the longer one, but still not quite as good as this one. The shorter (1/10 second) shot didn’t show as much of the motion of the flame as this one did. This is another picture from my adventures on the academic side of campus before leaving this past semester. 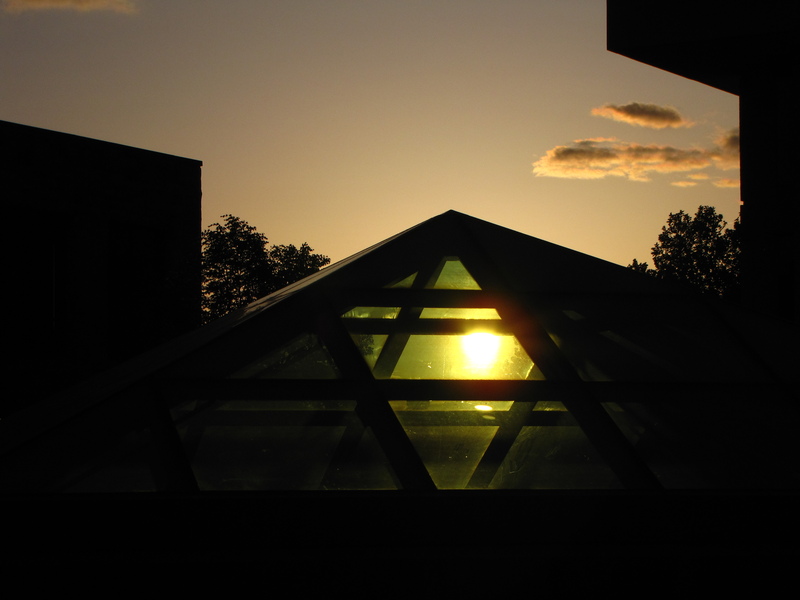 The shot is of the setting sun seen through one of the glass pyramids in the courtyard behind Burruss. This is another shot I was lucky to notice as I was walking past. All I noticed at first was a slightly discolored shadow against the back of the building behind me, so I turned around and knelt down in order to get this shot. I played around with the exposure a good amount before finding the setting I really liked. This one got a good amount of color in the illuminated glass, but didn’t blow out the sky or the clouds. I also really like the solid dark silhouettes of the buildings around the edges of the picture, especially the one in the top right corner. I’m also very excited about the research program I’ll be attending. As I said before, I really enjoyed the research I’ve done this past semester, and it will be nice to experience it in a slightly different branch of mathematics and at a different university. These pictures come from a trip I took with some friends down to my Aunt’s cabin in N.C. near the end of the semester. Things can get pretty hectic around this time of year, and it was really nice to be able to just get away from it all for a few days. 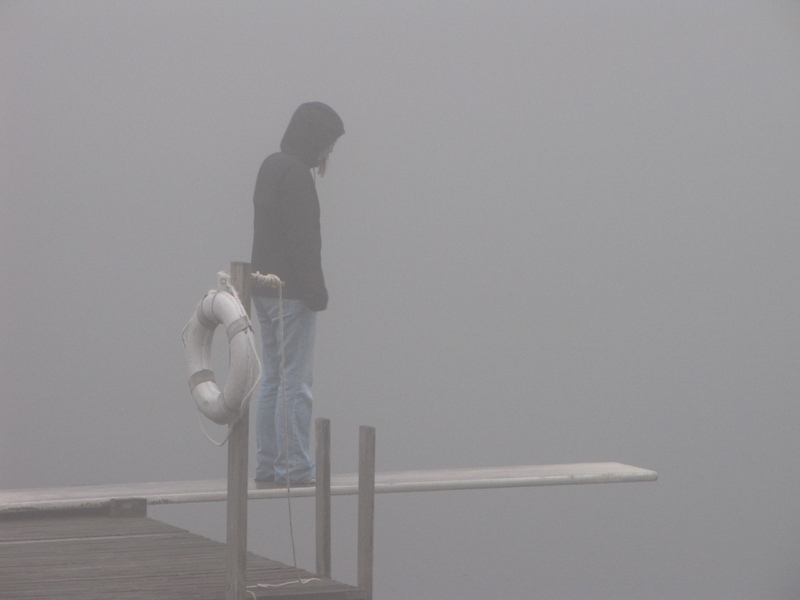 Our second night there, it was really foggy, so we went down to the lake to see what it was like in the fog. I had trouble deciding between these two shots. I really like the composition of the first one with the dock in the lower left corner. I feel like it gives a sense of stability to the shot. The fact that the subject only went half-way out on the board seems to add to the effect. It seems like she’s hesitant to venture any further away from the safety offered by the dock, and the life preserver hanging there. She also seems to be looking down, at the board, as if trying to decide just how far out to go. The second shot is it’s opposite in many respects. It lacks the stability of the first as you cannot see the dock at all, just the board, which you can kinda see bending down beneath his weight. 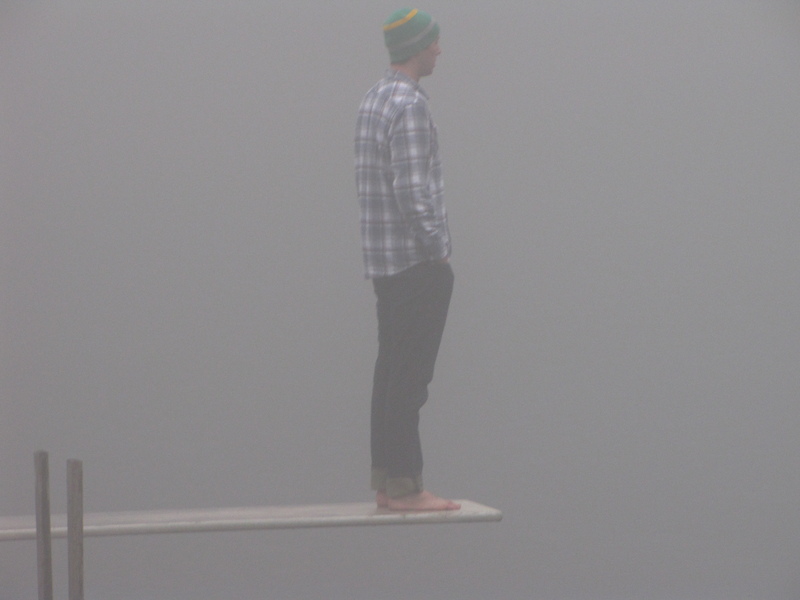 The subject in this shot has walked all the way to the end of the board, and is looking off into the distance, as if trying to determine what is beyond the fog. It adds a lot to the shot that you cannot see the water beneath the board or the trees in the background. This scene could be occurring anywhere; he could be standing over the edge of a canyon for all we know. Stylistically, I think it would have been a little better to put a little more empty space in front of him, but I couldn’t really crop this one much without losing the top of his head or the board beneath him. The unknown can be a scary thing, and we can either shy away from it, clinging to the surety of the things we can already see around us or step out to the edge and meet it face to face. I had told myself that I wouldn’t let this happen again, but things got pretty crazy at the end of the semester. But more on that later; first the picture. I know this is not one of my clearer pictures that I’ve posted on here, but I really liked the effect, and it kinda fit what I wanted to write about. 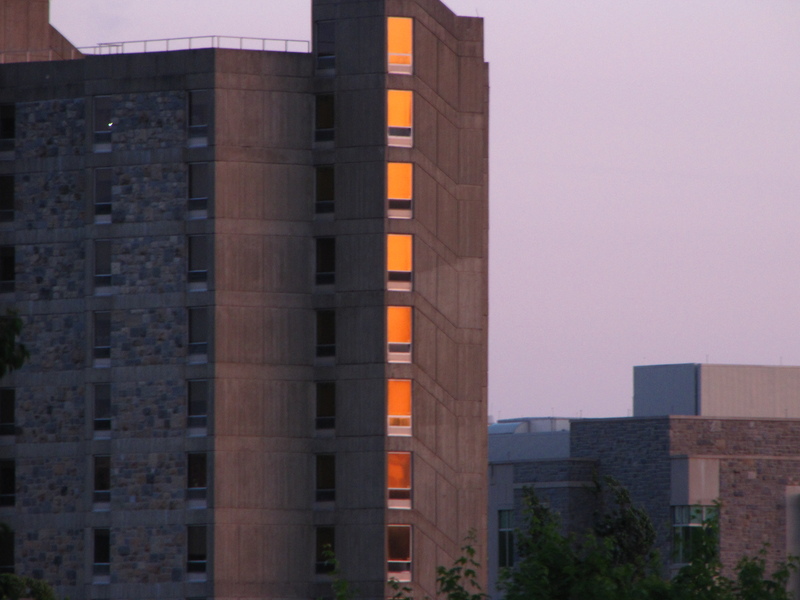 This is a shot of the staircase of Slusher Tower taken from across the drillfield, by the entrance to McBryde. This is another reason that I love the zoom on my camera. If I had had to walk across the drillfield to get closer, the angle of the shot and of the sun would have been completely ruined. I had gone out about half an hour before the sunset and decided on a whim to go through and take some pictures on the academic side of campus for a change. I ended up with some pretty good ones, which I’m sure will be up here in the near future. This semester, and not just the past few weeks, has really been a doozy. After making it through exams and coming home late last week, I’ve had a little bit of time to sit back and reflect on all that’s happened. I think it’s safe to say, that without a doubt, this past semester has been my best one at Tech so far. Academically, everything seemed to go my way this semester. Though I had to drop my Real Analysis course, I think doing that allowed me to focus more on everything else. There were some unpleasant times with a couple of group projects throughout the semester, but at this point in my life, I’m pretty much used to that, and I know how to cope with it. Final exams really stressed me out this year, some before I took them, and some after the fact. I spent a lot of time preparing for my history exam, and ended up doing extremely well on it. I felt kind of blindsided by a huge essay section on one of my CS exams though, and was worried about my grade in the class until our final grades came out this weekend. In the end, though, everything turned out fine. My main new academic adventure this semester was my undergraduate research with the math department. Working with one of my favorite professors from the year before, Dr. Peter Linnell, I conducted a project researching “Ultraproducts of Finite Groups.” The culmination of this project was a final report, which I’ll put up here sometime soon, and a presentation to the Layman Prize committee. I was really freaked out about the presentation, which had to be 20-30 minutes long, but I spent plenty of time preparing and practicing, and everything went surprisingly smoothly, unlike my experiences in public speaking a couple of semesters ago. I guess I’m just a lot more comfortable talking about something like this that I’ve spent the whole semester working on rather than the more spur of the moment speeches in other classes. Anyway, my project was chosen by the committee for the Layman Prize, which had a nice cash component to it as well. Things went pretty well outside of the classroom as well. After being introduced to swing dancing at the beginning of the semester, I came to enjoy it a lot. Everyone at the SVSDS dances was really friendly and welcoming to newcomers, and after the first few weeks, I was feeling a lot more at home on Friday nights at the Y. I also started going to Blues Night at the cellar every Monday with my friend Caleb. Though I was way too scared the first couple of weeks, eventually he persuaded me to get up and dance in front of a group of complete strangers. With live music and plenty of dancing, Monday nights became one of the things I looked forward to every week. Now, I didn’t forget about salsa during this time. I kept my position within the club and kept teaching lessons, which I really enjoyed doing. One of the things I know I’ve talked about here a lot is attempting to find the right balance between work and play to keep me sane and happy. I don’t think I’ve quite found the magic formula yet, but I’m a whole lot closer than before. I made sure to make time this semester for the things and the people that I care about. Despite taking 20 hours of classes, I was able to spend more time with my friends this semester. I think I was fairly successful in reconnecting with a couple of the people that I had somewhat drifted apart from. I also became very close with a couple of people that I had known before, but not very well. And on top of that, I made several amazing new friends who have been there to pick me up and help keep me going when things started turning south. It’s not to say that everything went my way this semester. I most certainly have my fair share of regrets. Plenty of things that I wish I had said, and a couple that I wish I hadn’t. I let myself walk out on a limb a number of times, and while the number of times that it snapped is fairly low, I feel like the majority of the time I couldn’t really chalk it up as a win or a loss. I could have been a little more aggressive in pursuing a number of things, but there’s no guarantee that that would have worked out any better. In the end, though, the good far outweighs the bad. I don’t think I burned any bridges in getting to where I am now, and the possibilities are all still in front of me. In giving myself a few days to think before writing this, I’ve come to realize that I really can’t go back and change anything at this point, and there are more than a few things about just those last few days on campus that I would change, so there’s no real reason to keep worrying about it. I’ve got to let them go, and make the best of the opportunities that the future holds. And to end on a more positive note, I am really looking forward to my trip out west in a few weeks. I’m planning on driving from N.C. to Oregon over the course of about 12 days, stopping to see a couple of friends and hopefully spending some days around Yellowstone or Glacier National Park.